The Perfume of Mystery: Black. Puredistance Black. Puredistance, a niche brand from the Netherlands, has just announced the upcoming release of their fifth perfume – Puredistance BLACK. Puredistance Black is an understated elegant and mysteriously charming perfume inspired by the concept of BLACK; a concept that for centuries has been associated with secrets, mystery and style. The essence of the concept was to create a perfume that is close to the wearer and releases sensual and elegant scent layers in a whispering way – without shouting. A mysterious fragrance that stays in the shadow, giving away – only every now and then – part of its nature. a sophisticated perfume full of charm with the same elegant personality as the timeless classic Puredistance I, but then more masculine and oriental. Puredistance BLACK is created by Antoine Lie “[a]nd as a consequence of the concept of BLACK (that treasures the beauty of the unknown) we will not reveal the ingredients of Puredistance BLACK…. Envision, Smell, Feel. Don’t analyse”. I am conflicted here. My first reaction to the announcement of this December release was: A new release from Puredistance? Great! I want to try it now! By the way, what’s in it?.. I have an utmost respect for the Puredistance brand but, from the market point of view, Chanel they are not. 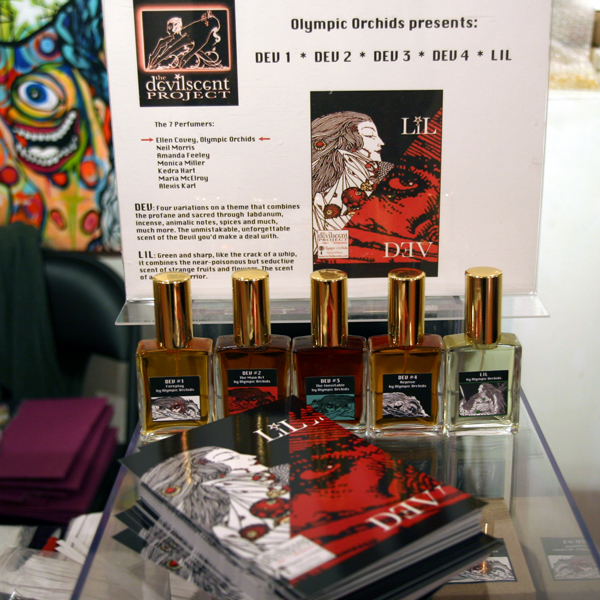 Their perfumes are available at very limited POSs. So even with the black bottle (hi to the last year’s fever for Chanel’s Coco Noir) it’s not like they can intrigue a huge segment of potential customers enough to go and sniff it at the closest department store. And with the brand’s price point I doubt there will be significant number of blind purchases. Then why all the mystery? As soon as first bloggers get to test this new perfume they will start to speculate about which notes went into the composition. Well, ok, not everybody will – I, for one, won’t trust my nose enough unless it’s something very-very prominent (but then, again, we all know we can’t completely trust what we smell) – but just give it to Kafka, Lucas or Mr. Hound and they’ll immediately come up with a list. I’m really curious what went into that advertising model. Do you have any thoughts as to how Puredistance Black benefits from that approach? I’m constantly on a lookout for new perfume-related … everything: brands, lines, perfumes, services, media coverage and other events. 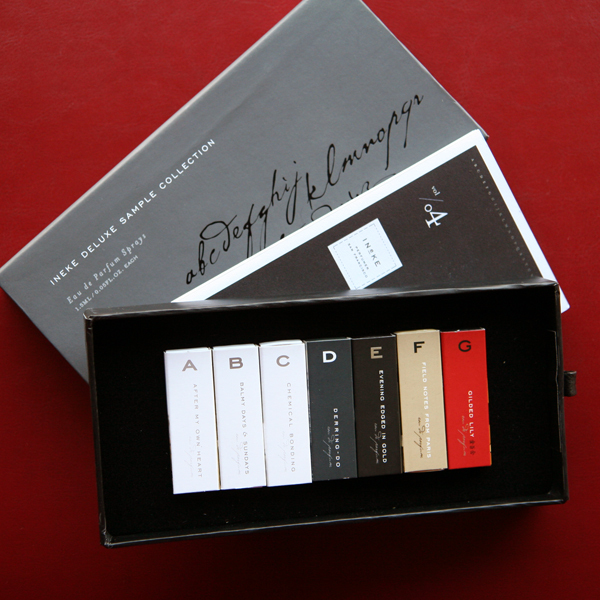 Naturally I got curious about the new service offering a subscription-based access to niche perfumes samples. 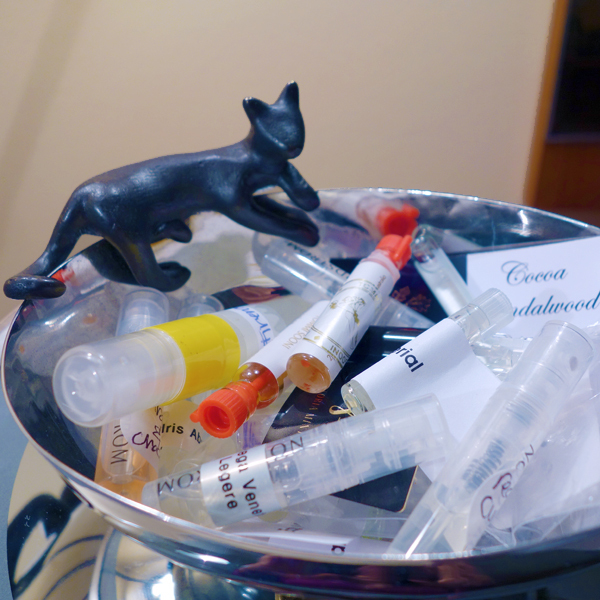 There are many ways to obtain samples for perfumes you want to try. I won’t be covering here getting samples from B&M stores, swapping with other perfumistas or participating in splits, all of which are my preferred methods. I want to look into different options for purchasing samples. 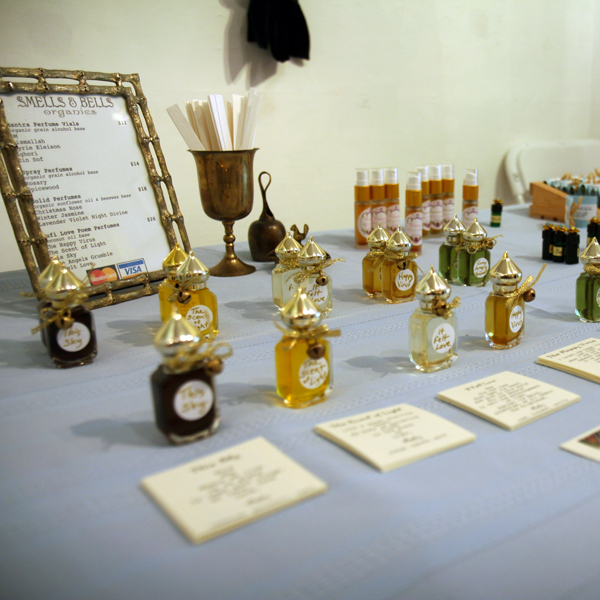 Lorraine (Dear Scent Diary) has recently compiled a list of the brands that offer samples. But it’s always a good idea to look for an official website and see what their samples policy is. if I’m interested in the particular brand, all other things being equal, I always try to buy samples from the brand directly. 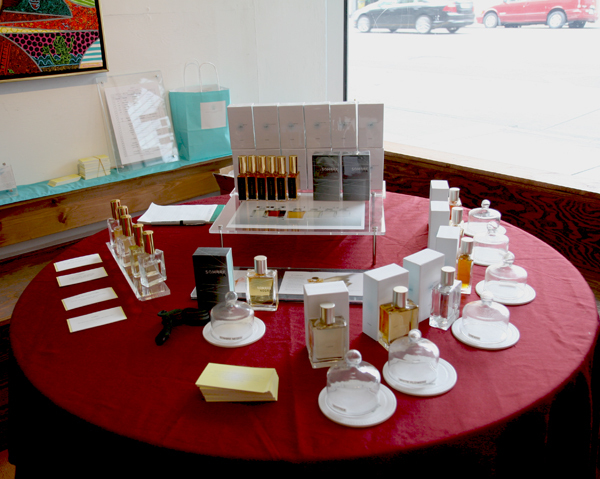 There are many services and online perfume stores that offer perfume samples of your choice, sometimes in a selection of sizes. Some of these companies have been around for a while, others are relatively new. So let’s take a look at the new kid on the block: Olfactif. Three dab vial samples (0.7 ml or 1 ml, I’m not sure and they don’t provide that information on the site), perfectly packaged, delivered monthly for $18 subscription fee. First month was offered free (I’m not sure if they plan to do that for future new subscribers). There is no obligation to keep the subscription for any minimum number of months. Steve (The Scented Hound) wrote about his experience with the first installment. $18 for three 0.7-1 ml niche samples including S&H is neither an outrageous price nor a bargain. For $17-$19 you can get 3 samples of your choice (including the latest releases) delivered from Luckyscent, Surrender to Chance, The Perfumed Court or The Posh Peasant. Aedes de Venustas offers 7 samples of your choice for $20 including S&H ($5 of which is refundable with any full bottle purchase within the next 3 months). Luscious Cargo offers 7 samples for $25 including S&H. MinNY offers 5 samples for ~ $28 including S&H or sells individual samples for $5. So what makes Olfactif different or unique? A good deal? One month’s subscription fee can be applied to a purchase of a full bottle of one of the featured perfumes. Taking into the account that it’s a full retail price plus shipping charges it’s not too exciting. Interviews with perfumers and information about perfumes? Look to the right: most blogs listed on My Reading List do it for free with a lot of passion and talent. A surprise? You pay $18 by the end of the month and then for a couple of days might enjoy not knowing what you’re getting (until your package arrives or the reveal – whatever comes first since according to the site’s FAQ you’ll get the package “a day or two before the first of the month or a day or two after”). I saw some comments from people being excited about that part – not knowing. I remember thinking that there was something in Chandler Burr’s blind sniffing idea but I just couldn’t get past $50+ for a blind buy of 50 ml of a perfume and a chance to play guess games for a month on Mr. Burr’s say-so*. Olfactif offers a speed-dating: 1 ml# x 3 for $18 and you can close your eyes and still do a blind testing. And that brings me to the last point. Curation. It’s an appealing concept. But who is Tara Swords and why would anyone rely upon her taste in choosing perfumes for them? She might be Turin, Burr and Coifan all-in-one but we don’t know that. There must be something in the air: it looks like there is market for that type of service. Last year there was a press release about MinNY launching Fragrance Flight, a Global By-Invitation Private Members Club with Privileged Access to Information, Luxury, & Curated Scents. Since then all I could find was a closed door and not a single mentioning of it. The first rule of Flight Club?.. 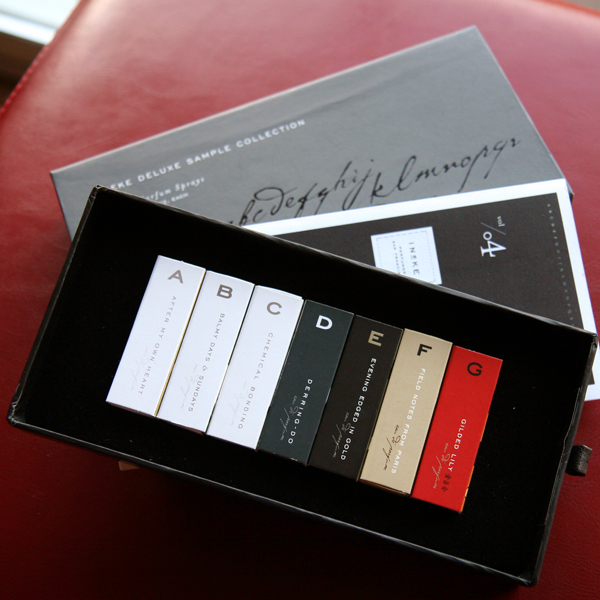 Recently I saw on Twitter “bergamot: Curated fragrances delivered to your door. Launching Spring 2013.” You can sign up to get notified about the launch. I have no real objections to Olfactif’s doing what they plan to do: it’s just a business, not worse than other businesses, and I hope that eventually either Olfactif improves: more customized approach, selection based on a user’s profile and previous months’ feedback, better deals, pre-releases, etc. ; or there will be another service that does it better. In the end we, consumers and perfume enthusiasts, might benefit. But if you are [still] reading this you do not need Olfactif in its current form: whether you know anything about niche perfumes or not, I believe you can do better. But if you see in that service something that I’m not seeing (other than nice boxes for storing samples) please share. * BTW, OpenSky is still running Burr’s project; there will be the ninth offering in May. I wasn’t following it after the third episode but from what I gathered now a year later they still haven’t figured out all the quirks. # UPDATE: Now Olfacif offers 2.25 ml spray samples, which is a huge improvement. Feeling emotionally connected to Miss Dior perfume for a while I considered risking an eBay purchase of another bottle of it. But then I finally tested a decant of the modern (pre-renaming-nonsense) version sent to me by Natalie (Another Perfume Blog) – and I liked it. So I figured I’d try to find Miss Dior not marked as “Originale.” It might be not as great as the older version but it would have taken away possible disappointment that comes with a spoiled vintage purchase. Last year, when the news about Dior‘s decision to use the name of this classic perfume for the reformulated beyond recognition Miss Dior Cherie hit the Blogosphere, there was no lack of strong emotions. Perfume enthusiasts thought it was an awful decision that was really unfair towards both consumers and perfume’s legacy. I remember commenting somewhere that the next generation of customers will have no idea they smell a completely different perfume and will be really puzzled reading older reviews. Little did I know how fast my prediction would come true! 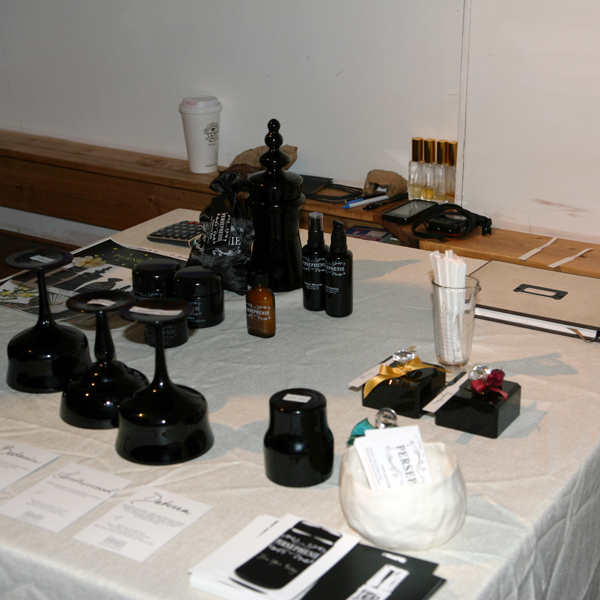 In November I participated in the Perfume Posse’s swap event. It was mostly successful for me (one full bottle and multiple decants exchange). One of the perfumes I tried to add to my collection was Miss Dior. 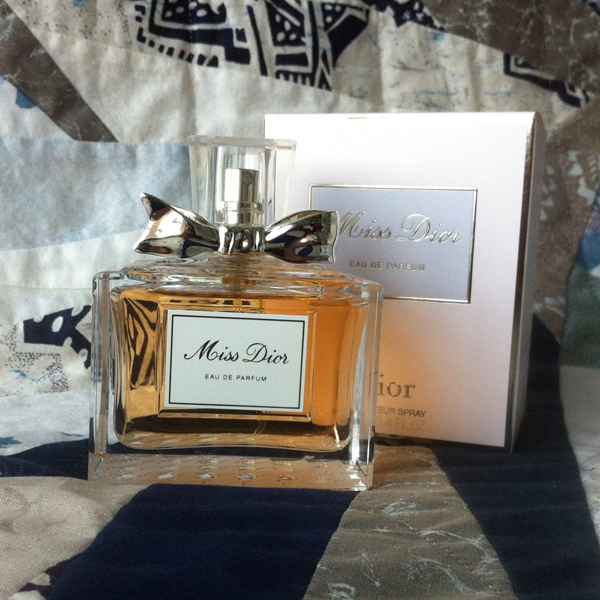 A member who offered a bottle for a swap mentioned that it had been bought from Saks and was definitely not Miss Dior Cherie. Since I was fine with any of real Miss Dior‘s existing formulations I asked only if it came with the original box – and we agreed on the swap terms. When the package arrived I didn’t even have to smell it (though I did) to realize that I’ve got the officially authorized imposter. The sad thing was that the sender was genuinely surprised: she was sure she had real Miss Dior that just didn’t work for her. Yes, she’s probably not the most experienced perfumista but she reads at least Perfume Posse. There is nothing to expect from a regular consumer. Dior has successfully rewritten the history. Off to eBay for the vintage Miss Dior hunting. Say “rose”, “peony”, “jasmine”, “lily-of-the-valley” or even “tulip” – and I immediately imagine both a flower and its scent. I hear “gardenia” and I draw a blank: I’m not sure I’ve ever seen it in nature and I can’t imagine how it smells. I saw gardenia petals at the Bouquets to Art exhibition (pictures two and tree in the post) but that was the closest I’ve ever come to the real thing. Probably because I have no preconception of gardenia I like many gardenia-centered perfumes – Cruel Gardenia by Guerlain, Gardenia by Jo Loves and White Flowers by Yosh. These perfumes do not smell similar to me so I’m still not sure how close to a gardenia flower these are. 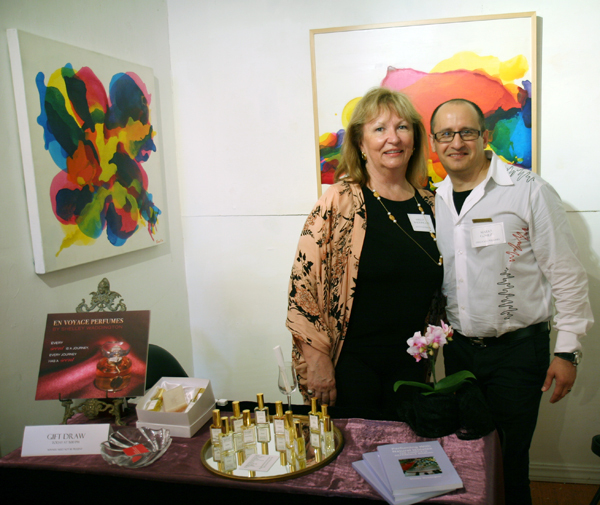 For the first time I smelled new gardenia soliflore perfume Hothouse Flower by Ineke in July of this year at the First Artisan Fragrance Salon in San Francisco. It smelled nice but I was so overwhelmed by everything I tried this day that I knew I wouldn’t be making it any justice. It was the end of the day and they were out of samples but Ineke Ruhland was very kind to make one for me. Since then I kept testing it. Hothouse Flower notes include Earl Grey tea, green foliage, cypress, absinthe, gardenia, galbanum, fig, frankincense, guaiac wood, musk and corn silk. Hothouse Flower smells green. But it’s not No 19 or Silences type of green. It’s more like a green apple green. It’s floral but not sweet – at least to my nose. It’s fresh but not ozonic. Hothouse Flower stays on my skin for at least five hours gradually fading out but not changing much. Despite of that it doesn’t seem overly simple. I’ve mentioned it before: Ineke has a great sample set. For $25 (shipping included) you’ll get the first seven perfumes of the line. Plus once Hothouse Flower is released in September they will send you a sample of it. Plus you can redeem the price of the set against a full bottle purchase later. But wait, there’s more! If you call in the next… Ok, just kidding. It’s not a commercial post, I just feel really excited about this release. I think I’ll need a bottle of Hothouse Flower. For many years Chanel and I weren’t getting along. I knew the brand had iconic perfumes. I knew it was well-loved and famous. I kept trying No. 5 and other perfumes again and again still wondering after each attempt what I couldn’t smell that others could. A couple of years ago on my way home from a pleasant trip to Sonoma wineries I stopped by a perfume counter at Nordstrom (I’ve never been to that store before or after) where I met a sales associate who was really passionate about Chanel perfumes. I didn’t try any other brands that day but I left the store in an even better mood and with five Chanel samples. And that was how it started. That Christmas I bought my very first bottle of Chanel perfume. It was Coco. Since then I enriched my collection with numerous bottles and decants from Chanel including some Exclusifs. Some of them went much higher in my personal hierarchy. But Coco holds that special place by being the First one. Coco by Chanel – created in 1984 by Jacques Polge; lists of notes are slightly different depending on the site, I’ll go with NST: jasmine, peach, frangipani, mimosa, orange blossom, cascarilla, rose, clove buds, angelica, labdanum, sandalwood, tonka bean, leather and opopanax. If you want real reviews here is Angela’s (now smell this) and here is the most recent by Suzanna (Bois de Jasmin). Three days ago I casually asked my friendly SA if she knew when they would be getting the new Coco Noir perfume and she very secretively handed me two samples saying that they weren’t supposed to show them yet, but for me… (She’s always good with me and I try to give her as much of my business as I can). 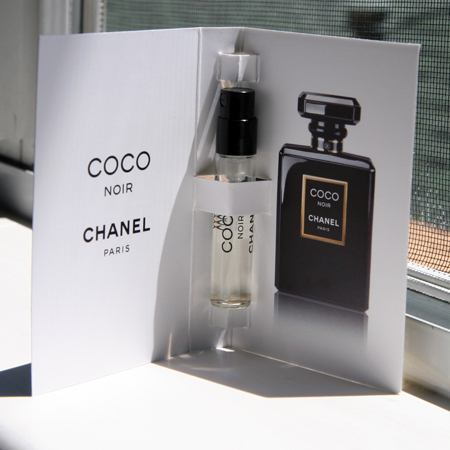 I do not trust my nose too much and I trust my ability to describe scents even less (not trying to be modest – just stating the fact) so these are just my impressions from testing Coco Noir in parallel with the original Coco. Coco Noir is definitely Coco’s close relative – a younger sister maybe? She thinks she is all grown up and should be taken seriously; she tries really hard to be like her older sister who is effortlessly elegant and confident. But even through her thoroughly applied smokey eyes, dramatic lipstick and cynical gaze one can still see the freshness of the youth and innocence. But enough of the metaphor. In my opinion, the only “noir” part of this recent Coco flanker is the bottle – and what a beautiful bottle it is! I’m glad it isn’t dark blue or I wouldn’t have been able to resist. Coco Noir by Chanel – created in 2012 by Jacques Polge; the notes include bergamot, grapefruit, orange, jasmine, rose, geranium, patchouli, tonka bean, vanilla, sandalwood, incense and white musk. Coco Noir smells fresher then Coco; it is brighter because of a more prominent citrus note and it doesn’t last as long as the original version. 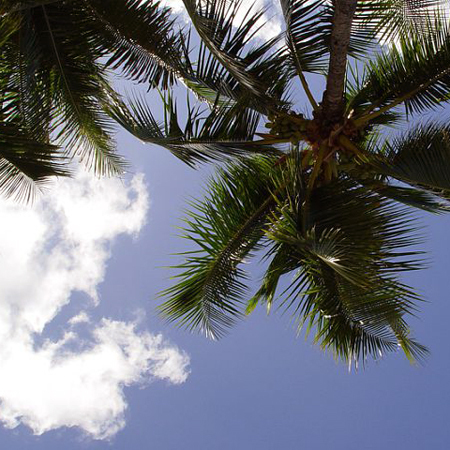 Coco Noir is “younger” than Coco in modern perfumery sense as well – it’s fruitier and sweeter in the opening. A younger sister who prefers fruit punch on a sunny day to a glass of cognac next to a burning fireplace. If anything, Coco Noir is lighter than original Coco. But they couldn’t have used that beautiful bottle for Coco Light – right? I do not think Coco’s fans will prefer Coco Noir and it’s not distinct enough to either justify the second bottle for a fan (unless you really want that bottle) or make a friend out of those who really disliked Coco. But if the original perfume was just a little too much for you Coco Noir might be an answer. Victoria (Bois de Jasmin) today published a real review of Coco Noir. If you’d like a chance to win a sample of Coco Noir you have until 23:59 PST on Saturday, August 4th. You do not need to do anything, just mention in your comment if you want to be in the draw. The only condition: you have previously commented on this blog at least once (I’ll know, no need mentioning that). 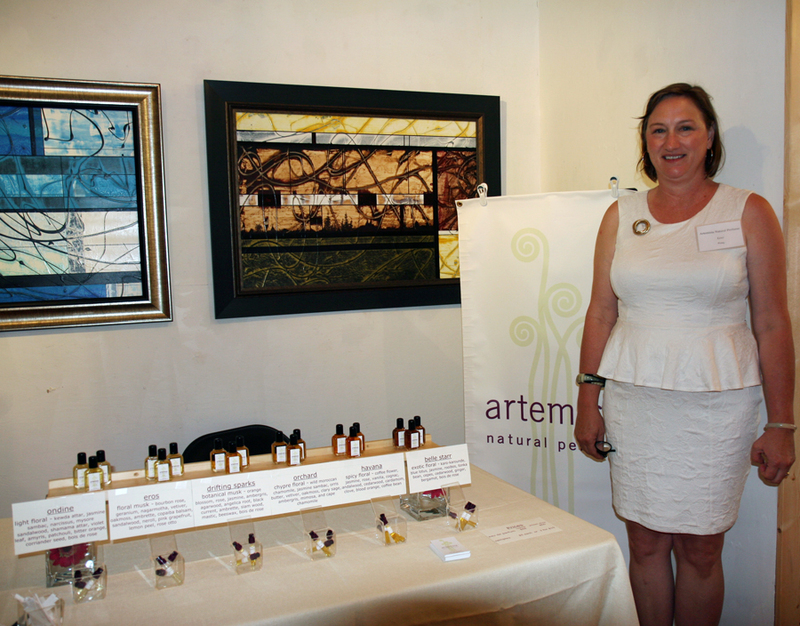 Last Sunday, July 8th, I spent the day at the First Artisan Fragrance Salon in San Francisco. 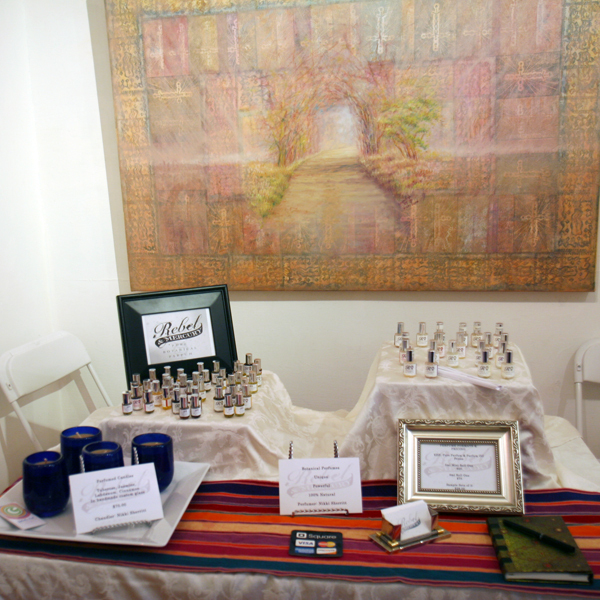 You’ve probably read something about it already so just to recap: twenty artisan perfume companies presented their perfumes at the Gallery 4N5. There were also wine and chocolate tasting as well as some talks and presentations. 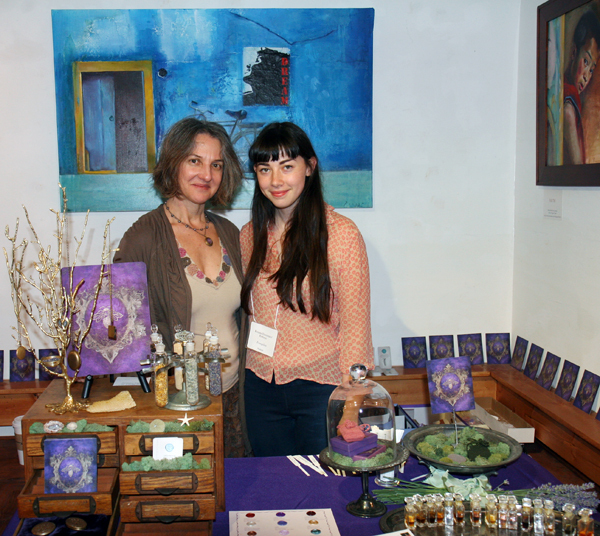 In the next couple of weeks I’ll try to write more about some of my personal discoveries at this Salon but I want to share with you pictures of those stands that I managed to take before there were too many people. Keep in mind that pictures on walls were a part of the Gallery decor and participants weren’t allowed to change those. Notice how perfectly some of the stands and art came together. I’m not sure if there was any special thinking behind those designations or if they just happen to come together by chance but some of them really played out. Click on pictures to see more details. Both Yosh (above) and Sonoma Scent Studio (below) found an elegant solution to the over-perfuming the small space: pre-sprayed glass containers. I really like the idea because in addition to the benefit mentioned there are multiple others: you do not need to remember which paper strip you sprayed with each perfume (which is even harder if you were given a blotter sprayed by a perfumer); you can revisit scents multiple times without trying to juggle those multiple paper strips and, finally, if you didn’t like the scent you do not need to decide if it’s polite to discard it right there, in front of a perfumer/presenter, or if you have to take it with you. 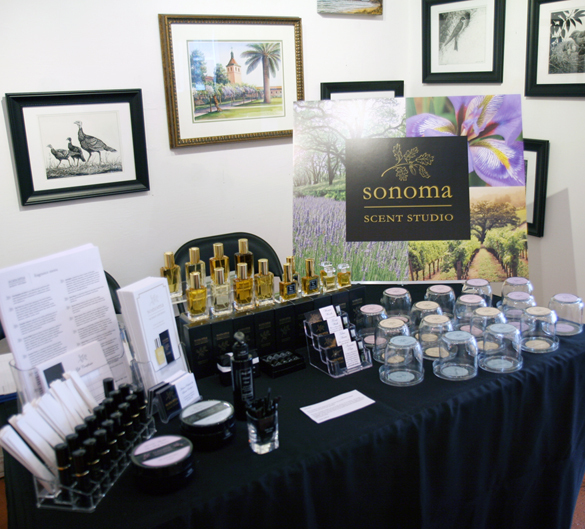 Many people were disappointed that Laurie Erickson, the nose behind Sonoma Scent Studio, couldn’t attend the event. On the positive side, there was her newest addition to the line Forest Walk and the stand looked very elegant. For a while I was considering one of Artemisia‘s perfumes – Ondine because of the name (it means the same as Undina, just a different spelling) but I’m not too good with all-natural perfumes, usually they don’t work for me. I should have probably bought a sample (though now I cannot remember if this table offered any for sale) but I was so overwhelmed with everything that I wasn’t thinking straight. Ineke had a very nice spot and they decorated it just perfectly. Do you see the stack of sample sets on the left? They were all sold out quickly. On the off-chance somebody doesn’t know that, this is one of the best discovery sets out there: for $25 including shipping you’re getting the cutest box with seven 2 ml individually wrapped samples and that price is redeemable for a purchase of a full bottle. Probably half of all participants didn’t have any samples for sale and I think it’s a mistake. I understand that for a small company it might be prohibitively expensive to give away samples and I didn’t expect them to do that. But it’s also hard to expect that people who have never smelled this brand’s perfumes (and sometimes haven’t even heard about its existence) before will distinguish any of the perfumes out of literally hundreds, fall in love with it and decide to spend $40-$135 on the spot for a full bottle. Some brands at least offered purse sprays under $20 (Sonoma Scent Studio and Olympic Orchids) which is a much more reasonable option. 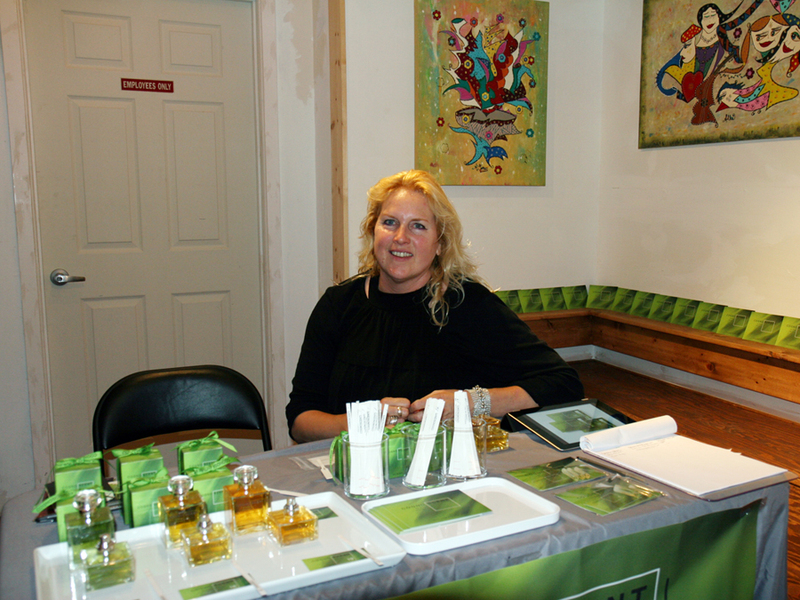 Shelley Waddington presented her newest The Cosmologie Collection. I liked A Study in Water on a blotter but I didn’t have a chance to test it on skin. I’ll need to revisit it one day. 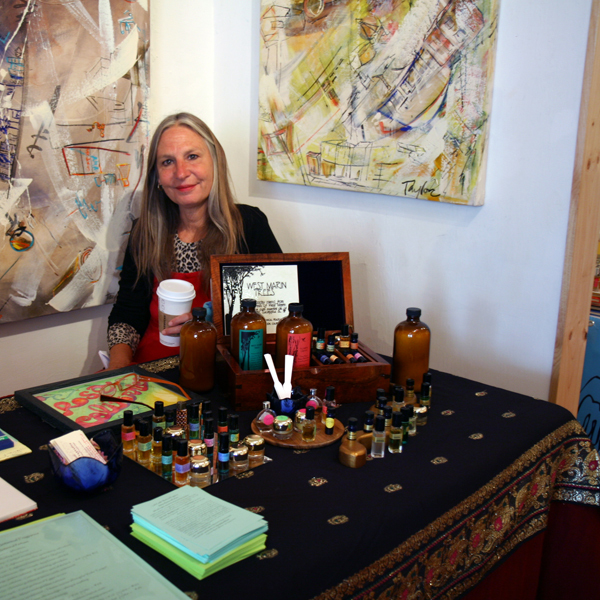 Ellen Covey, the perfumer, in addition to the main collection, also introduced her new collection created for the Devilscent Project. I found my favorite out of five – Dev 2. Those beautiful green and gold paper boxes are sample sets. Since perfumes are oils they are expensive. While I understand $5+ for 1 ml, there was just one perfume in the line to which I was immediately attracted so I just couldn’t justify paying $40 for the sample set. Maybe I should have… Well, I have time to think about it since those can be ordered from the website. One more brand that decided to use glass as a medium for perfumes testing (though it bothered me a little that there was three glasses of one form and one of another). If I ever come across this line I’ll test it more: I was too tired by the time I got to them. 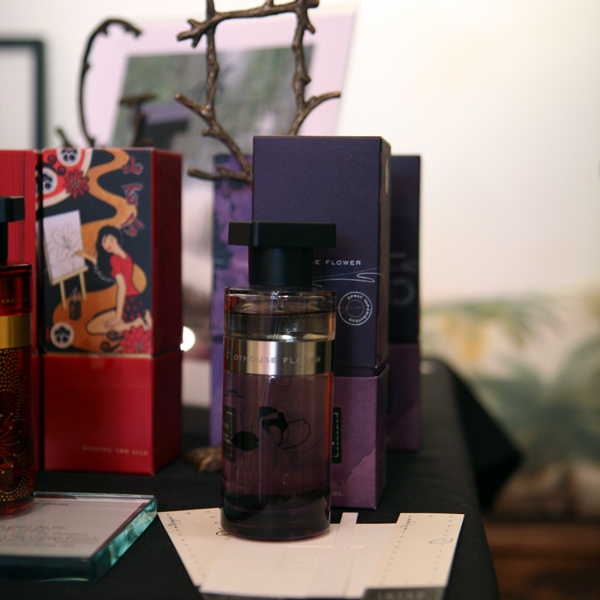 And, finally, there was one brand new brand that launched that day at the Fragrance Salon – Cognoscenti. 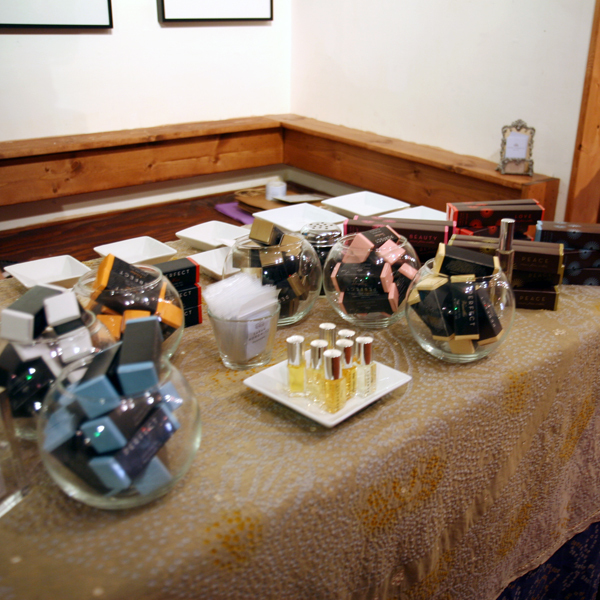 There are just three perfumes in the line (that is how brands/lines should be launched!) and I liked one of them enough to put on the skin. I will test all three more and see if I have a story to tell. 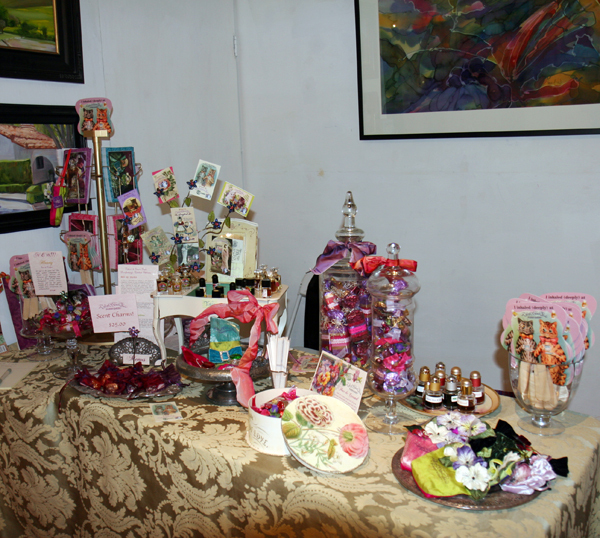 There were several more stands – Ayala Moriel Parfums, Divine Life Perfume and Parfums DelRae but my pictures of those tables are too blurry to share. 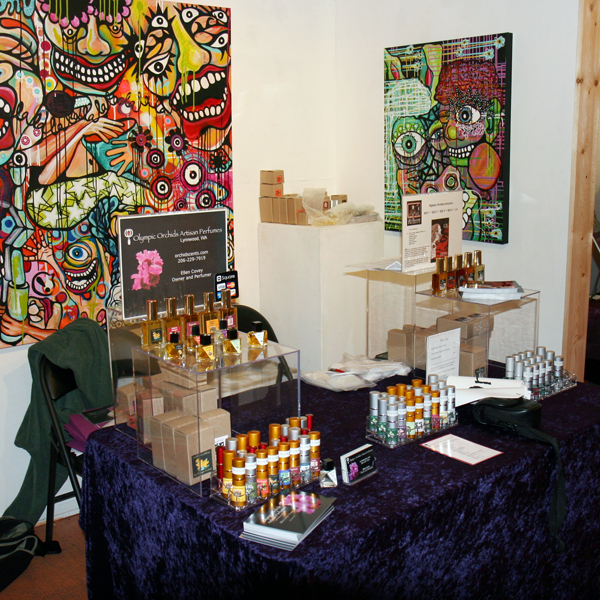 I enjoyed the event: friendly and warm atmosphere, beautifully decorated stands and an unimaginable variety of perfumes, perfumed oils, body products and other scent-related items. On the negative side – music in some areas was too loud, it was hard talking to people; too many perfumes were sprayed in the area without a proper ventilation and just simply NOT ENOUGH TIME to try even brands about which I knew before – leave alone completely new ones. But I really tried. I hope this will actually become an annual event because I want to go to the next one already. Sometimes a small stupid thing rubs you the wrong way, you keep thinking about it and just can’t let it go. Usually I let it steep for a while and then just drop it. But sometimes I feel like I still want to say something. This is one of those cases. Many popular perfume blogs published recently information about the upcoming Chandler Burr’s project, which he runs under the umbrella of a “social shopping” (whatever it means) site OpenSky.com. I won’t repeat PR information but if you somehow missed all the postings about this project I refer you to the post on Olfactoria’s Travels from which I learned about it first. For anybody whose interests are in the perfume field the idea of a blind sniffing isn’t new. Basenotes monthly blind sniff threads come to mind (e.g. March Blind Sniff Orient Express – The Red Line). Earlier this year I read about Blind Sniff Roulette: pronti, via! Ready to go! project at La gardenia nell’occhiello blog (you can read also Christos’ story Pomegranate Noir: the joy of blind sniffing revisited about his participation and re-discovery of one of his favorite perfumes). I even ran my own blind comparison projects (Déjà vu, Episode 2: huge floral vs. abstract floral and Déjà vu, Episode 3: powdery fruit vs. peony oriental vs. sandalwood jasmine). And these are just off the top of my head. Why do we all it? Because we know that we’re susceptible to external factors (brand, packaging, LT&TC’s opinion, you name it) and are curious how we’ll feel about the scent if we remove any surrounding noise. Does anybody need a 50 ml bottle to experience “a work of art” on their arm? Let’s say it together: NO! I usually complain about 50 ml of the perfumes that I know I like…Why on Earth would I want to pay $50 (+$3.75 S&H) for an unknown scent? To prove what? Chanel No 5 and Shalimar are extremely well made and beautiful perfumes – with or without the packaging and marketing hoopla. But I wouldn’t want to wear any one of them even if I got them for free – leave alone paid for an ugly decant bottle. Just to make it even more real, would you want to pay $50 for a decant of Paris by YSL, Le De by Givenchy, Calyx by Prescriptives or Cologne by Thierry Mugler? I didn’t just come up with those perfumes – I got them from different Burr’s articles where he gave those very high ratings. 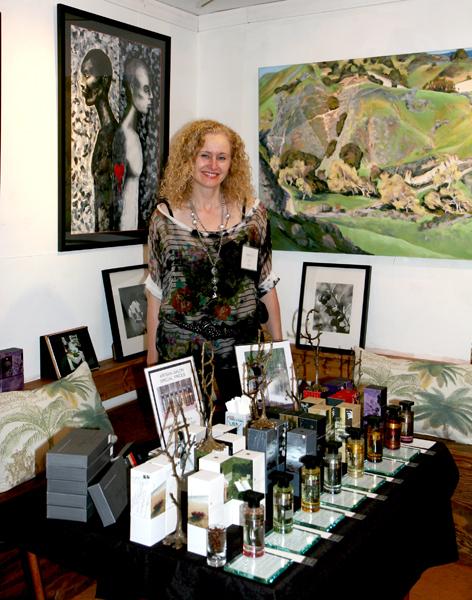 On Birgit’s blog the argument was made that Art can’t live without money. 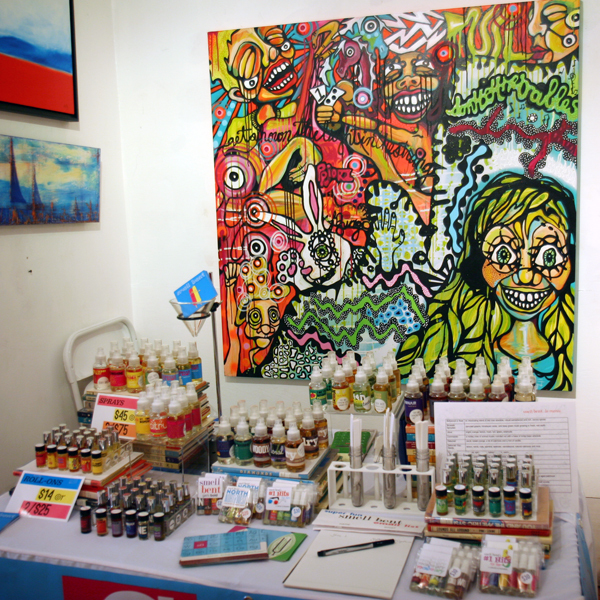 I completely agree that art requires investments! And I do not mind paying for going to a gallery or an exhibition. And I wouldn’t mind paying for a carefully curated blind sniffing art project: ten 3-5 ml unidentified sample bottles for $50-$60; plus an option to buy an actual manufacturer bottle of the perfume you liked for an offered price but still not knowing the name. I understand that a shopping site is supposed to generate an income to those who run it so actual names might not be revealed for some time (more than a month) to prevent people from going and finding them cheaper somewhere else. Something along these lines might have intrigued me enough to gamble. I do not think Chandler Burr is in this project for money (we’re talking about $5,000/month revenue even if all 100 decants will be sold – it’s nothing). But it’s definitely not for the art. This probably is Art. OpenSky is commerce. And marketing. And publicity: see, we are talking about it. So, buyers shouldn’t be influenced by brands’ ad copies, clips, packaging and names. They should doubt their own perception of a perfume because it’s distorted by “sensory noise”. But it’s OK to buy a 50 ml (sorry, I can’t get past it) bottle because Chandler Burr said that “it’s one of the few scents I know that smells like a state of grace” and that it is “almost unnervingly perfect. It has an astonishing olfactory texture, soft, cool, precise.” Because it’s not like he’s trying to sell them anything, right?